Today’s graduates are conditioned to want what they want, when they want it. In a digital world where everything is available immediately, why should a diploma be any different? 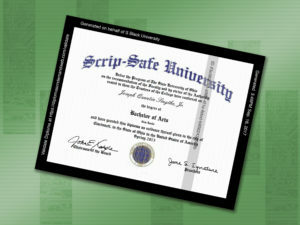 Enter SCRIP-SAFE’s Diplomas Direct. This “add-on” feature to Diplomas on Demand lets you to send a verifiable electronic version of your graduate’s diploma whenever needed, wherever needed. Providing instant gratification – send students a diploma copy before you have finished printing the original. Assisting international students – diplomas are often valued above transcripts overseas. Give your students the opportunity to apply for jobs while their traditional diploma travels through the apostille process. Sharing success – Let students share their hard-earned success by posting their electronic diploma on social media or linking a copy in their LinkedIn account. Our customers find Diplomas Direct a cost-effective, flexible way to keep pace with ever-changing demands in education. Diplomas Direct utilizes our Diplomas on Demand platform, meaning it is web based and requires no support or installation from your IT team. Diplomas Direct makes diplomas more secure than ever. Each diploma contains a one-of-a-kind verification link, allowing employers and institutions to validate the authenticity of each document. Maintain complete control on your end with the ability to activate or de-activate an issued diploma at any time. Learn more about our web-based Diplomas on Demand.